I have another polish from the Pure Ice Fairytale Forest collection to share with you today. This was a winter collection that was found at Walmart in early winter. I'm not sure if you can still find these, but I hope there maybe a few bottles hanging around somewhere because this is a great color. 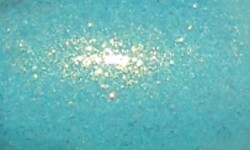 Precious Jewel is soft aqua/aquamarine with an intense golden shimmer. Color: I love this beautiful shade of blue-green. What makes this polish though is that beautiful golden shimmer. This is that magical kind of shimmer that makes it look sun-kissed. You know I love cool-toned colors with gold shimmer! Formula: The formula on this was OK. It was a bit streaky and uneven. I needed 3 coats. I can't really fault it too much because the price is so low. Price: This was $1.99 at Walmart. Overall: This is a great find for a drugstore priced polish. I think the color is beautiful and I adore the shimmer. The formula isn't the best, but it's not terrible either. I can't complain much $2.